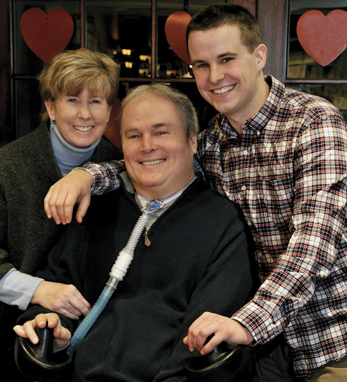 A gunshot changed Steven McDonald’s life forever. As a young NYPD detective he was shot on July 12, 1986 when questioning a 15-year old about possible bicycle thefts. The shooting left him a quadriplegic. But with the help of family and friends, notably his wife Patti who was pregnant with their son Conor at the time, he turned tragedy into inspiration and went on to become a noted public speaker, notably on behalf of the NYPD, peace initiatives in Northern Ireland, the U.S. Navy (he was a hospital corpsman) and speaking with students about violence and forgiveness. His wife of over twenty-seven years, Patricia Ann McDonald, was elected Mayor of Malverne on Long Island in March 2007 and his son, Conor McDonald, joined the NYPD in 2010. Both Patti Ann and Steven grew up on Long Island – Patti in Malverne, where her father taught English at a local high school, Steven in nearby Rockville Centre. He was one of eight children and both his father and maternal grandfather were New York City cops. After a stint in the Navy, he followed in their path and joined the NYPD. “We are in this together, as a family,” Steven said speaking on the phone to Irish America. And we are proud to honor the McDonalds as the first family to be inducted into the Irish America Hall of Fame.